From this page you can download diagrams of several Greek mathematical works reproduced from the manuscripts: Euclid's Elements, Books 2-4, 6, 11-13, Phaenomena, Optics, as well Arabic translation of Menelaus' Spherics. In proposition III.13 of the Elements, Euclid proves (by contradiction) that two circles cannot touch at two points either internally or externally. 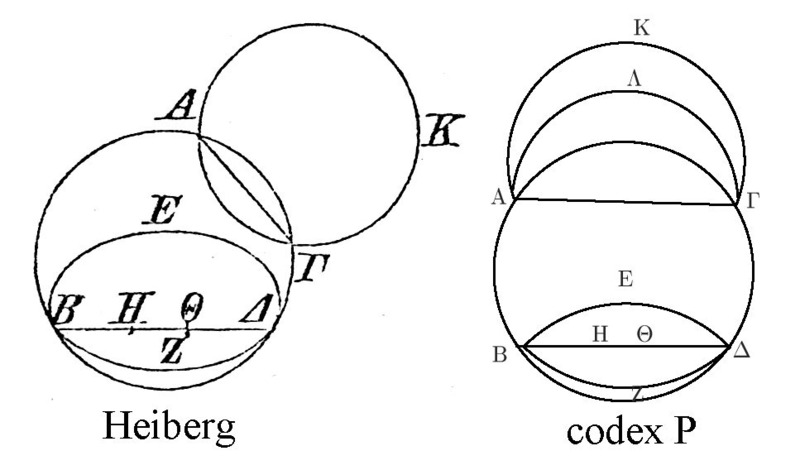 All the modern editions have a diagram similar to the one in the left, which appears in Heiberg's edition. However, the diagram found in the manuscripts is like the one in the right, which is a faithful reproduction from Vatican manuscript of the ninth century. Here, the second circle ΑΚΓ touching externally at two points to the first circle ΑΒΓΔ is represented by a lunule, which Heiberg (more precisely August, whose diagrams were copied by Heiberg) has changed into a circle. Corrections in Book XII (pp. 141-161) on December 14, 2014. Correction in page 71 on April 27, 2013. For the diagrams of the Elements Book VI, see the newer report above: "Reproduced Diagrams from Greek and Arabic manuscriptsReproduced Diagrams"
The diagrams of proposition III.36 in codex F (article 2) has been revised.